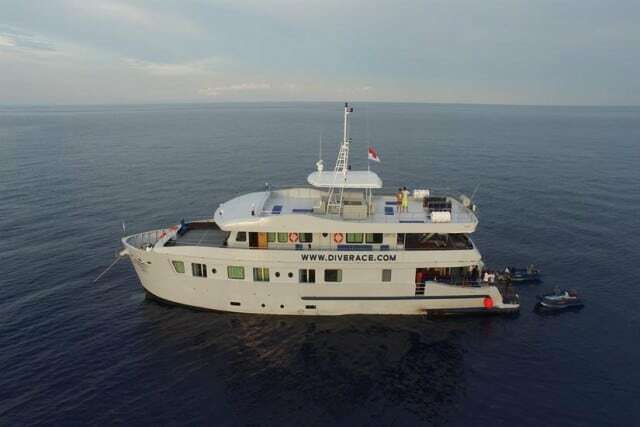 MV Diverace Class E is a purpose built liveaboard vessel built in December 2014. Designed for comfort and safety, Diverace Class E was the brainchild of a team of naval architects and Dutch vessel consultants. The Similans Islands Marine Park and Surin Islands National Park offering arguably the best diving that Thailand has to offer. Taking in dive sites from the south at Island #4, #5 and #6 such as “Anita’s Reef”, through to the northern most areas of the Thai waters at the legendary Richelieu Rock. There’s great topography, abundant marine life and, on some occasions, the chance to see large pelagic life such as Manta Rays and Sharks. Also cruising these waters are peer vessels such as the MV Giamani and Thailand Aggressor. Diverace Class E is 34.5m long and with a beam of 7.5m. This makes her almost identical in length and breadth Thailand Aggressor. 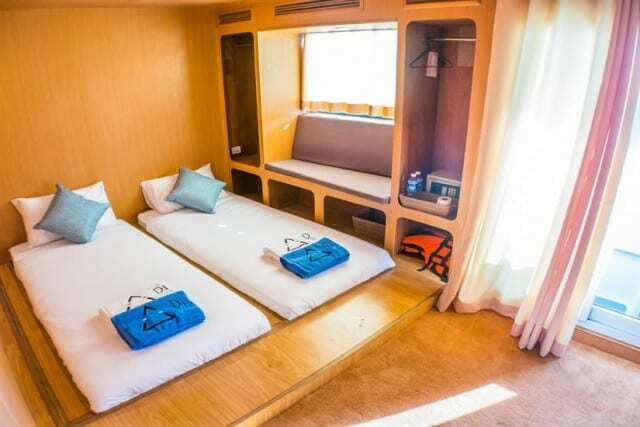 However, due to her unique, modern design and clever layout, Diverace is able to comfortably accommodate 28 guest across her cabins, compared to 16 on the Thailand Aggressor. 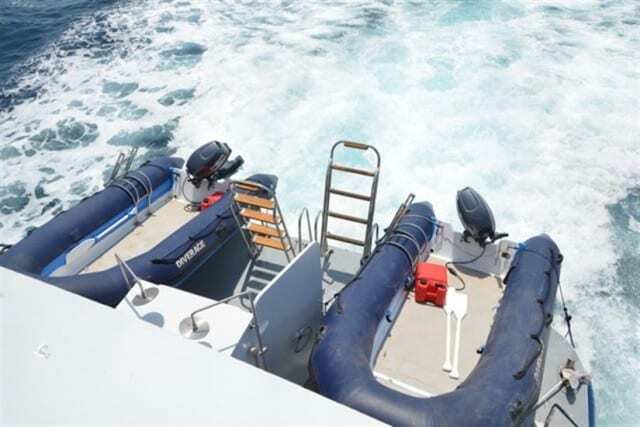 With the inevitable travel between the stunning islands and pinnacles, this modern vessel is equipped with twin 1,200hp engines to minimise travel time and make your journey smoother and safer. The twin-share luxury cabins feature their own private balcony. And, depending on your circumstances, you can choose a twin or double layout. 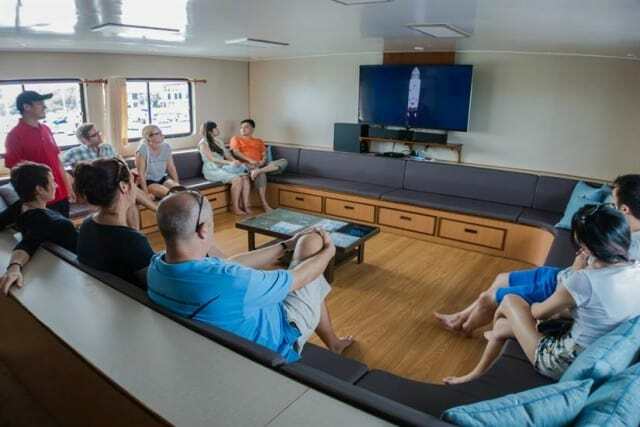 The four quad-share cabins are perfect for a group of friends on a diving holiday blowing bubbles or, alternatively, a family trip. 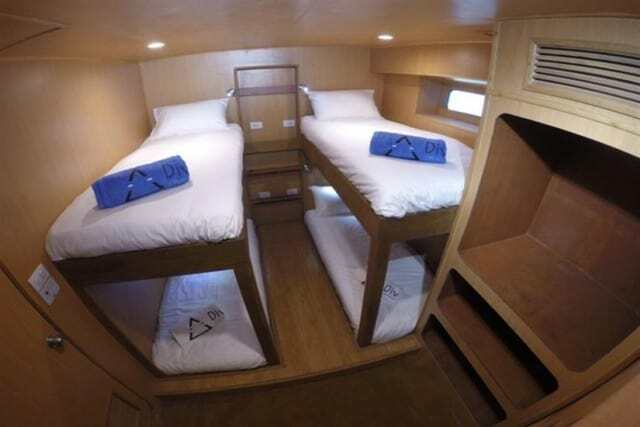 All cabins are clean, light and airy, and feature their own private bathroom and complimentary toiletries, charging sockets for appliances and their own individual air-conditioning controls. Most of your time is likely to be spent outside of the vessel’s cabins. And the MV Diverace Class E diving boat also impresses here. 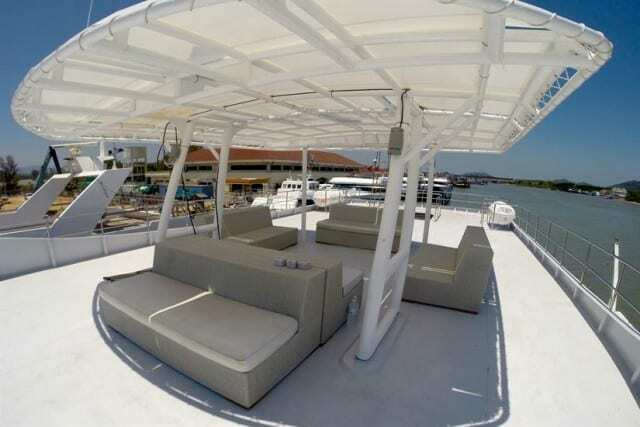 You can opt to bake on the sun deck in the heat of the Asian sun and top up your tan while slurping on a chilled drink. Or, alternatively, you may wish to relax in the air-conditioned saloon and catch a movie on the 60inch TV system. Or you may just want to check your photos at the multimedia station. The choice is yours! Meals are planned each day and served to all guest after Scuba diving; as soon as you’ve dried off from the dive and taken advantage of your complimentary hot towel and tea. With regard to the diving, there is a full compliment of 10 boat crew and 5 dive crew onboard to ensure you are catered for. The boat is rebreather/tek friendly should you be that way inclined. And, an added bonus is that Nitrox is available onboard for a reasonable supplement. 2 x 4.5m Dinghies are on standby for inwater pick-ups and support and the boat is equipped with all the crucial safety equipment. All itineraries take in the wonderful Similan and Surin National parks. The price differentiator s being the cabin and length of voyage. With prices for the itineraries varying between THB33,600-88,000 (excluding marine park fees approx.) 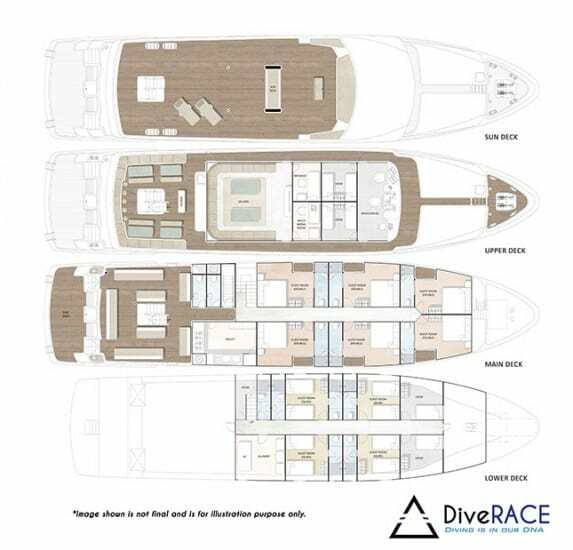 the Diverace Class E is competively priced and is a superb new addition to the vessels touring these islands from Phuket. Starting point of many liveaboards to dive the Similan and Surin Islands. Khao Lak has also good local diving sites. If you have been diving on board this liveaboard dive boat in Khao Lak & Phuket & Similan Islands & Surin Islands, please share your review and let us know what you thought. Please post your comments in the review section below, by doing so you will help fellow divers to plan their next diving trip . We did the Similan Islands trip on this vessel in Nov 2016. The so called luxury cabin was a big disappointment – grotty and beaten up, a couple of mattresses on the floor, and leaking pipework in the bathroom. It is very basic. The dive operation was pretty competent with well organised dive deck, good divemaster and very helpful staff. Unfortunately after dropping off the divers the two inflatables return to the boat and do not provide surface cover (I couldn’t dive one day and observed this). The food was OK but not great. 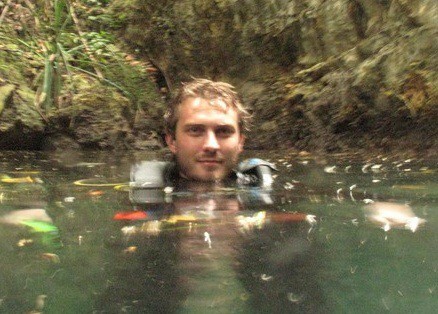 Also a few too many regulations for my liking.The diving is average but nice tropical reef diving. Richelieu Rock is however a lovely dive. More for beginners than experienced divers. Great ship and even better staff. Not the most luxurious ship but it is comfortable. We only had 7 divers which is only about 25% capacity but the crew went above and beyond. I’ve never had anyone help put my boots on or unzip my wetsuit before. A bit odd but they are just looking to help where they can. The only gripe I have was dumping of the septic tanks while stationary. It stunk up the cabins something awful. Hi Dave! Thanks for the review! I’m sure it was epic with only 7 divers on board this quite big vessel! A new vessel to the Similan and Surin National Parks, this vessel is a brand new, modern design.